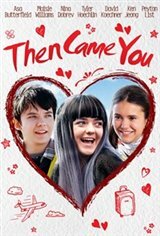 THEN CAME YOU is a sweet, uplifting tale that reminds us it's not how long we live, but how we live the life we have, that matters. The film tells the story of Skye (Maisie Williams), a spunky teenager with a terminal illness who befriends Calvin (Asa Butterfield), a 19-year old hypochondriac who is afraid of his own shadow. Calvin helps Skye carry out her eccentric bucket list of things to do before she dies. In the process, he learns to confront and conquer his own fears, including falling in love with the beautiful, but seemingly untouchable, Izzy.